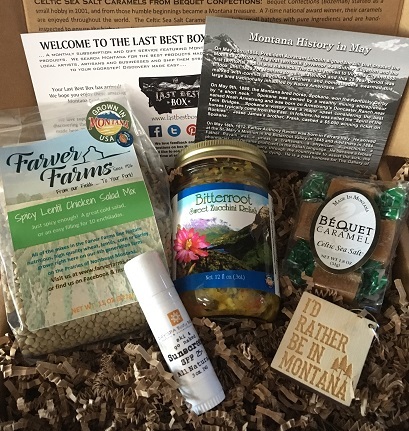 Do you want to get The Last Best Box or send it as a gift, but can't wait until the next month's box is shipped? Consider one of our 2018 May Boxes. It includes Bitterroot Sweet Zucchini Relish from Western Montana Specialty Foods (Superior), Spicy Lentil Chicken Salad Mix from Farver Farms (Scobey), Celtic Sea Salt Caramels from Bequet Confections (Bozeman), Ski & Go Naked Sunscreen Stick from DAYSPA Body Basics (Missoula), and “I’d Rather Be in Montana” Keychain from The Montana Scene (Kalispell). **This box is separate from the monthly subscription, and can be shipped anytime. We use USPS 1-3 priority mail, and generally ship your box 1-3 days after you place your order. Contact us if you have any special instructions!